It’s a scary moment when you realize just how dangerous the world really is, especially if your day-to-day life involves battling against giant monsters, like the teens in Digimon Tri’s second film. The last film (or four episodes for those of you watching outside of Japan) dealt mainly with team leader Tai coming to see Digimon with adult eyes. While saving the world with Digimon was fun as a child, the teenage Tai was rocked by the realization that Digimon are not only dangerous but can cause massive collateral damage in their battles as well. What was once simple good versus evil has become a whole lot more complicated. 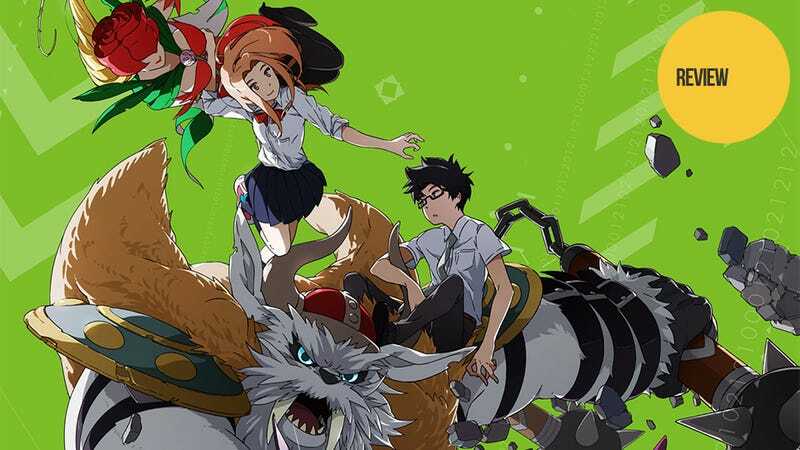 Digimon Tri: Determination begins with some much needed downtime for our heroes after their first major Digimon battles in many years, not to mention their discovery of Mei, a new DigiDestined. The group and their Digimon head to a hotsprings bath house styled after a traditional Japanese town during a festival. This allows for some lighthearted slapstick comedy as some of the Digimon get lost and the female DigiDestined invade the male half of the bathhouse to find them. This serves as our first true introduction to Mei and her partner Meicoomon. Both are shy and innocent but are quickly accepted into the group as a whole. While Mei clearly bonds with the others, Mimi and Sora especially, she never talks about her past, vaguely dodging the question whenever it comes up. And by the end, it becomes clear she and her Digimon are far more connected to the infected Digimon invasion than the other DigiDestined could have dreamed. Determination also shows the enigmatic return of Ken, the antagonist-turned-protagonist of Digimon’s second season. The first film showed us brief snippets of the DigiDestined from season two being defeated, including Ken. Yet, in this film, Ken is seemingly back and spends most of his time watching the DigiDestined from afar—once again wearing the garb of his evil persona: the Digimon Emperor. As he never speaks in the film, his motives are left unclear. When he kidnaps Meicoomon, this action forces Palmon and Gomamon to form a stronger bond with their human partners and allows the two Digimon to reach their ultimate forms, allowing them to defeat a twisted version of the second season’s ultimate hero Imperialdramon. Afterwards, Ken simply releases Meicoomon and disappears, leaving us to wonder if he has once again become the villain or is simply playing the role of one in order to help the Digidestined overcome the coming-of-age doubts that are holding them (and their Digimon) back. Most of the runtime in Determination is dominated by the coming-of-age stories of Mimi and Joe. Mimi’s defining characteristic as a DigiDestined is that of purity. She wears her emotions on her sleeve and is not afraid to voice her opinions or do what she feels to be right. As a child, her way of acting was precocious. As a young adult, what she deems to be self-confident can easily be viewed as self-centered by others. Seeing the Digimon be vilified in the media causes Mimi to try to act heroically to show the world that good Digimon exist. Unfortunately, when a TV news copter is caught in the crossfire of Palmon’s battle and crashes, the Digimon become more hated than ever. In this way, Mimi is forced to come to grips with the fact that even the best of intentions don’t matter if the results don’t match, something that, along with her troubles at school, throw her into a personal crisis. At school, Mimi faces a problem that many “returnees”—i.e., Japanese children who spend an extended time abroad—are forced to deal with: reverse culture shock. In a country like America, being straightforward and assertive serves you well. In Japan, these traits tend to be seen as bossy and rude. For years, people have been direct with Mimi, confronting her if they don’t agree with her. So if no one objects, she assumes all is okay. However, because Japanese culture in general abhors direct conflict, the other students are annoyed by her inability to read between the lines and see when she is being unreasonable. This realization leaves her questioning her identity, reconsidering the purity of thought and action that is the very core of her being. Joe’s personal crisis was touched upon in the previous film. As the oldest of the DigiDestined, he is the first of the group that will become an adult. Joe is in the midst of preparing for his future. While the others enjoy their high school life, Joe studies, goes to cram schools, and takes endless practice tests. Yet no matter how hard he works, he is clearly not Ivy League material. Then, in the middle of his personal crisis, he is again called upon to be a DigiDestined and thus battle giant monsters. At its core, what is driving Joe crazy is his lack of choice. Being a DigiDestined is not his choice. Nor is growing up and becoming a productive member of society. Being both at once seems impossible for him. He can’t change the fact that he is growing up, that is just human nature. However, somehow he was chosen to be a DigiDestined. Now he simply wants to know why. Why would an average kid be chosen to fight giant monsters, especially a kid who hates fighting? While Mimi’s core is one of purity, Joe’s is one of honesty. All the events in his life have caused him to be unable to be honest with himself. His loving parents want him to be an Ivy League student with a bright future. He says he wants that too, though this is a lie. He wants to be a DigiDestined alongside his Digimon and his friends. But like Tai, Joe is also old enough now to understand how terrifying Digimon fighting is. Fighting monsters is not safe. He is scared. Yet, as he sees the problems Mimi is facing, he comes to a simple decision: It’s better to be selfish and assertive like Mimi than be a coward like himself. And saying this to her in turn helps both of the troubled teens to come to terms with who they are and who they want to be going forward. Digimon Tri: Determination excellently continues what the first film began: showing how the DigiDestined grow up. As a character piece, it shows what Mimi and Joe face as they come of age. At the same time, it teases us with just enough new information to build up a few plot mysteries, keeping our interest piqued until the next movie comes out in September. And overall, this film makes it even clearer that this is not a Digimon story for kids as much as it is a story for those of us who were kids in the 90s. And as part of that demographic, I have to say that it’s pretty fantastic. Digimon Tri: Determination was released in Japanese theaters on March 12, 2016. It can be viewed for free and with English subtitles on Crunchyroll.